Time came to take Gilli-the-Bus out on the road again for a prolonged adventure. 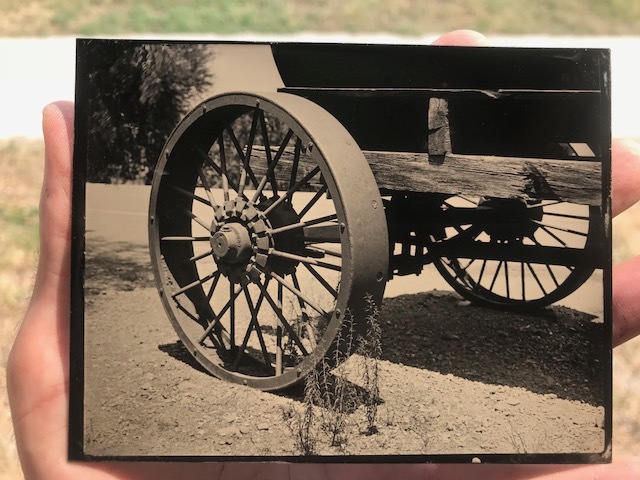 This time around, along with offering wet plate workshops different states and continuing to create via in that medium, I want to concentrate on working with daguerreotype technique on the road. To me daguerreotype is the purest form of photography and thus most beautiful, and my goal is to streamline my workflow in the field. Also, I wanted to show some of the natural beauty of this country to my girlfriend, who I knew would make the trip more fun. The plan for this trip is rather loose. 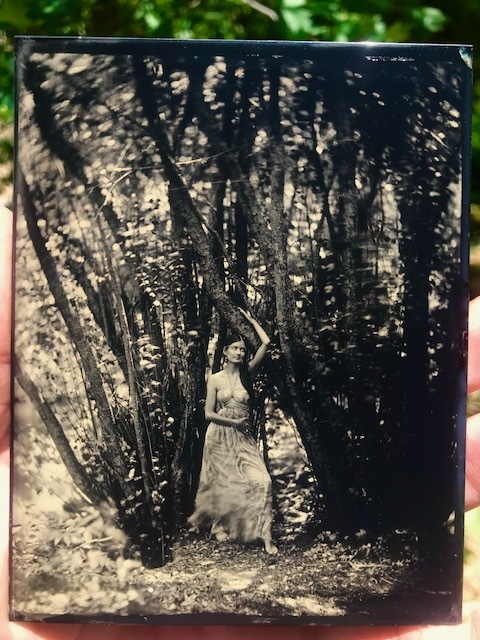 I scheduled a few wet plate workshops, set up some portrait sessions, and in between those the aim is to find some nice nature spots to get away to and make daguerreotypes. Originally the plan was to make it as far as John Coffer’s Wet Plate Jamboree , and I even corresponded with John on that matter. However, after some careful and difficult calculations I realize now that I simply can’t make it there and should stick to the western part of US in order to both not blow the budget completely out of proportion and, most importantly, to have time to concentrate on daguerreotyping. A heart-wrenching apology letter is now on its way to John, hope he doesn’t hold this one against me – I’ll do my very best to make it there next year, with or without Gilli. First stop after leaving San Diego on Sunday the 15th, was a workshop east of Gilroy CA with Wayne Seltzer. We met off highway 152 at a little tourist trap of a rest spot called Casa De Fruta. I think at some point it was a fruit farm, and it may as well still be that in the background. Now though it’s basically a private mini amusement park with a little railroad and peacocks and old equipment and a gift shop and so on. I passed that place many times on my way from San Jose to San Diego when I went to school there and so I knew there was a good parking spot for Gilli. Wayne met us there Monday morning and we dove right into it, while Jozlynn had a picnic among the peacocks and did some painting. After I showed Wayne the ropes and we did a little developing test strip and an image, it was time for him to pour his own plate and for his first subject we decided to do a portrait of him. He did great, just a little hesitant. Hesitation is actually a very common thing among beginners with this process. 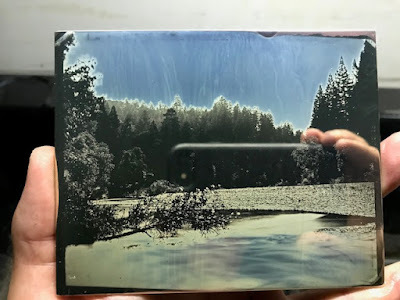 While collodion does require a relatively high level of care and one can’t be sloppy if good clean images are desired, the actual pouring of any liquid onto the plate should be done with bravery and determination and in a steady controlled stream, which of course varies from one step to another. Many beginners are timid with the liquid and it’s of course understandable. Wayne’s plates were great though – below is the plate I made as an example, and Wayne’s first plate. Can’t wait to see him acquire gear and chemistry and start pouring. While rummaging through chemistry boxes recently packed into the bus for the ling journey, I discovered, to my chagrin, that I left a gallon and a half of freshly mixed and tested silver in my sink in San Diego… Having only brought minimal amount of silver nitrate crystals for emergency purposes, I was now faced with not being able to fill my 8x20in tank, and I was really looking forward to putting my freshly-refinished banquet Burke and James. Luckily I was very close to Bay Area and needed to pass through there on the way up the coast. 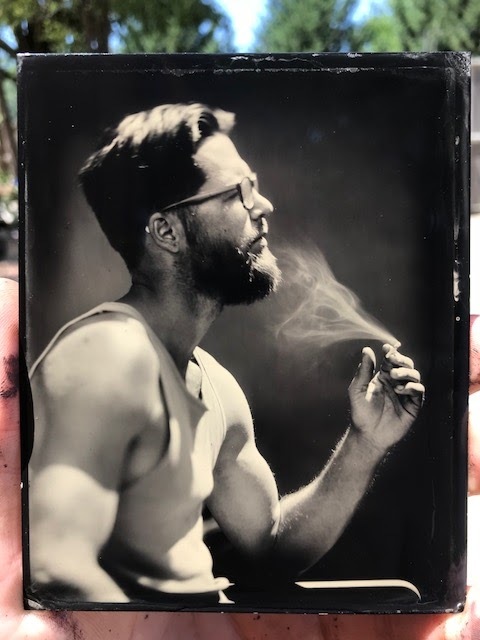 I had a strong feeling that after some panicky texting to local wet plate artists I would be able to procure 200-300g that I would need to be back in action. Indeed, I soon had three positive replies. While two of my wet plate brothers didn’t have quite enough crystals in stock, Tony Seghal said he had a bit of extra on hand and so, due to my initial negligence, I had a pleasure of briefly meeting him and his family just east of my San Jose. Resupplied with 200g of silver nitrate I now had just enough for some panoramic images and moved on up, across the Golden Gate Bridge and into the best part of California. 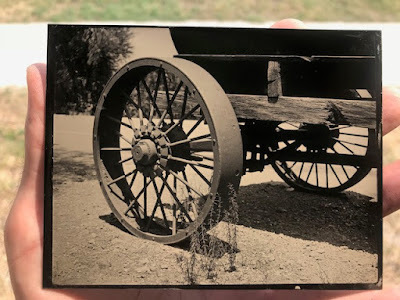 Next on the agenda was a really exciting project; a commission I received to make a number of daguerreotype and wet plate images at a picturesque Northern California farm in Willow Creek. Before that though, I wanted to take a day or two to test all systems by making a few plates. Next day another systems test was to be done, this time in my favorite little park in the whole works – Redwood Park in Arcata. It’s a fairy tale type park where one can walk among 200+ft trees and feel like an ant. I found an incredible parking spot in the 11th street parking lot, after finding out that my usual larger 14th street one was closed for city activities. That parking spot I found though deserves a picture and that's why it's leading this post on top. Gilli-the-Bus is longer than the entire width of that parking lot, and so to find this little miracle at the very end of it and closest to the trails was a real blessing. There I made two plates. One of them was slightly damaged during gilding, but the second one finished just right and so with that accomplished I was ready to move a bit east to the farm assignment. While on the NYCTrip earlier this year, I met Michael Patterson – a collector of daguerreotypes, who runs a high-functioning organic vegetable farm in the middle of redwood forest. I can’t even begin to list all the crops grown there, but I can say that this farm is operated with love and attention that every farm should receive. 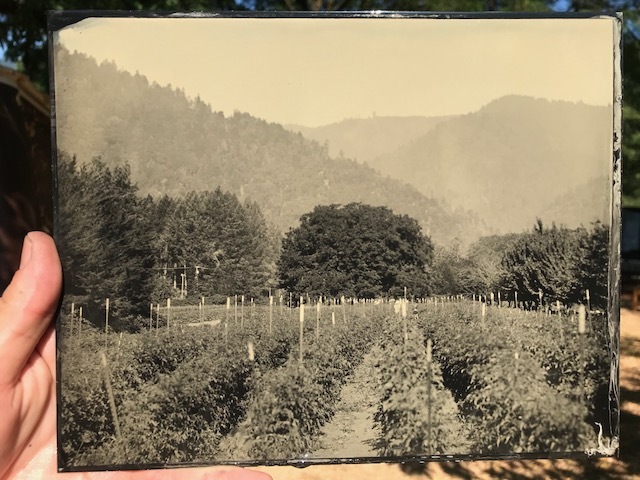 In New York, Michael mentioned that he would like his farm documented with daguerreotypes, so we kept in touch and as the trip neared, made plans that fell on the days when he’s not quite as busy with tending the land. 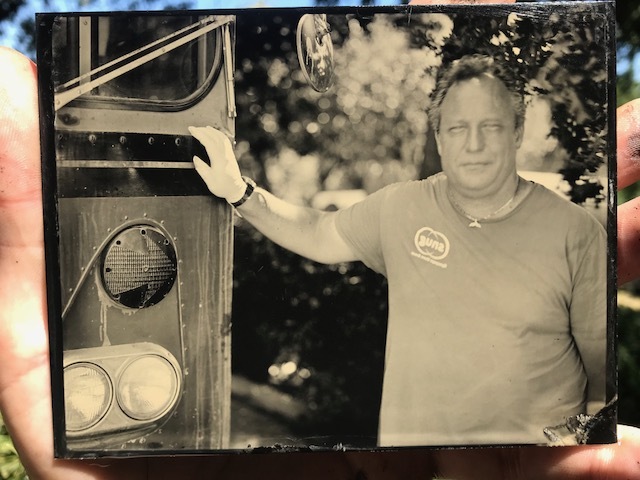 Michael moved north from Los Angeles in the 80s and in the 90s was introduced to daguerreotype collecting and aesthetics by Peter Palmquist. You may remember that name from the West Coast Trip Part I entry. Prior to his untimely passing, he was a very prominent member of daguerreotype circles and I was lucky enough to meet his long-time partner Pam Mendelson, who bestowed upon me Peter’s camera – a Burke and James 4x5 Orbitar. It’s an oddball camera, which has a fixed 65mm lens with helicoid focusing, designed for ultra-wide shots only. I took it along with me because of cameras I have it’s actually the easiest one to use in order to have 65mm lens on 4x5 format. As it happens, the daguerreotype I made of Michael’s house was done with that camera and the image, which completed a certain historic circle, came out beautifully ethereal. 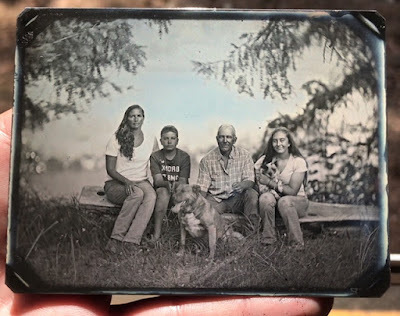 Another image made during the two days competed a long-time arc – the ¼ plate image of Michael’s family was placed in a beautifully crafted leather case, made by Alan Bekhuis more than 15 years ago when he still lived in New York City. Now Alan lives in New Zealand, makes top-end daguerreotype equipment, and doesn’t have time to spend on small projects like cases, but back then he made them perfectly, with the best hinges and locks I’ve ever seen in modern cases, and Michael hung on to that one case for all these years waiting to fill it with a worth image. It was truly an honor to be able to end that wait and with a plate developed in a chamber made by Alan himself. All in all, the farm experience was surreally satisfying – while making a plate of two pepper plants against the background of forested hills, I realized that there’s no place I’d rather be at or activity I’d rather be performing and a real sense of bliss came over me. I very much look forward to possibility of similar jobs in the future. Jozlynn also picked up a new artistic passion – wood burning. There was a simple burner in the communal kitchen of field crew, and we both had our go at it. 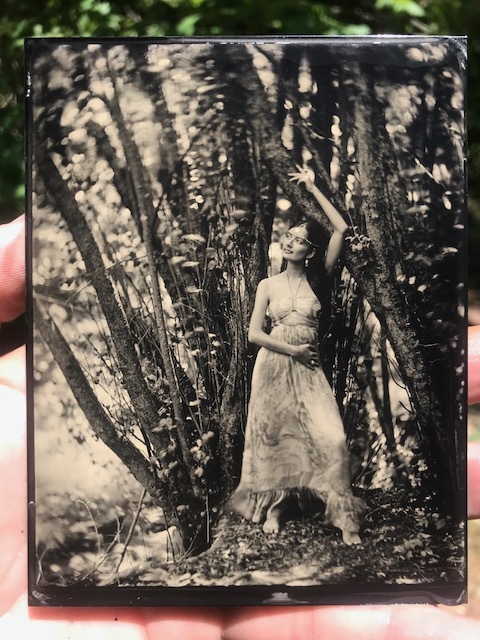 Jozlynn got so much into it that she was up burning away into the wee hours of the night as I was in the darkroom varnishing tintypes and sealing daguerreotypes. I hope to receive good scans of the plates I made for Michael later, so I can use them in my portfolio, but here’s a quick video of the family daguerreotype and an 8x10 tintype of the field of tomatoes with a gorgeous walnut tree in the background. 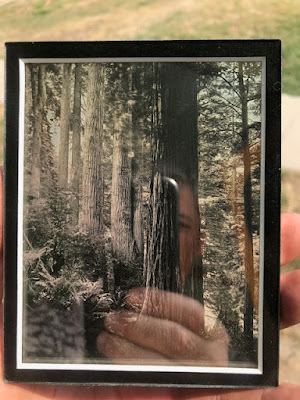 Before I left I had to make a daguerreotype for myself. 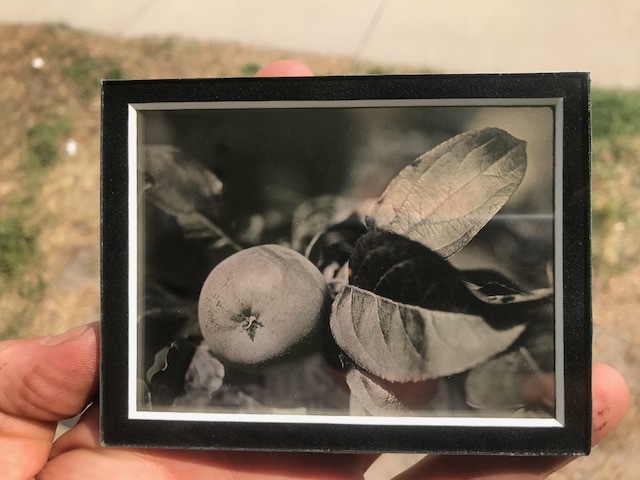 For my subject I chose an apple tree that we were parked next to. Since childhood I've had a connection with apples and trees they grow on and so I really like this plate. It's simple and makes my mouth water. 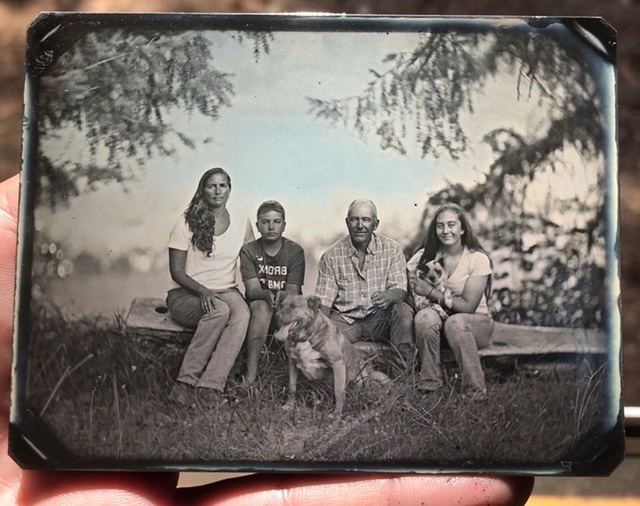 In the morning, before leaving I was asked to make a tintype by one of the farm hands named Tyler. He’s got a great personality and is artistic in his own right, so he came up with a concept and asked me to execute. He wanted to be pictured sitting with a morning coffee and a cigarette, smoke rising, contemplating future paths. Collodion is slow and is not known for capturing smoke very well with natural light, but I gladly accepted the challenge and after making the first plate from a bit farther away and with more of the farm atmosphere included, moved in for the second plate, which I wanted for myself after seeing how the first one turned out. With a lens cap for shutter and my trusty 8.5in 3.2 Voigtlander Petzval I was able to secure the following results. We departed in the afternoon and drove all day east and slightly south, in the direction of Nevada City, CA, where I had another scheduled workshop with Val Camp. Val is an avid darkroom and digital photographer, and works in the movie industry. He was really excited to be able to dip his toes in some collodion, and his attentiveness allowed him to catch on right away, so pretty much all the plates we did that day on the side of the little park chosen as workshop location were near perfect. Here’s the plate with which I showed him the ropes and then his first plate - you can hardly tell apart the quality. I think another quality collodion artist will soon be making his appearance. 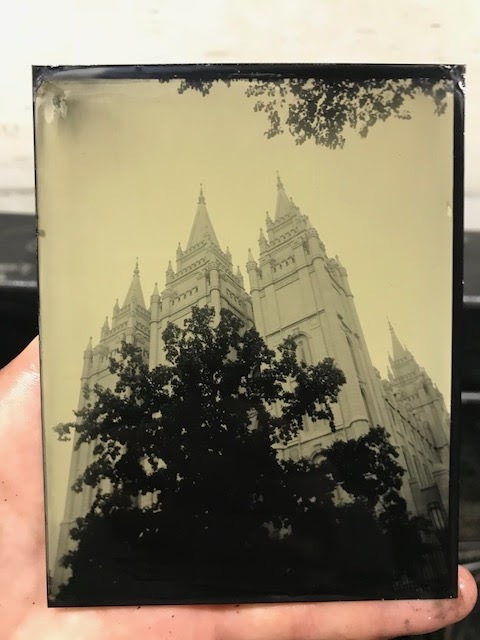 After the workshop we drove east in the direction to Salt Lake City, where Christopher Erin, a very talented ULF film and wet plate photographer, was waiting for a daguerreotype plate of his own to be made. 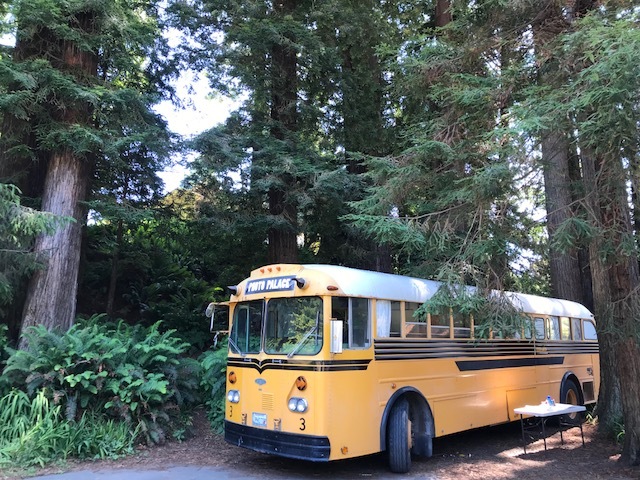 The easiest way out of Nevada City going east is highway 20, which goes over a number of mountain passes and thus is slow as molasses to drive on in a 40 year old bus… On top of one of the mountains there’s a pullout with a parking lot and a nice view. I saw that spot from the corner of my eye and had to turn around a bit down the road, but it was all worth it. The view was tremendous and I decided to put the 8x20 B&J to use there for the first time. Since I had to mix silver and fill the tank, prep time took a bit longer than usual, but that just gave the light a chance to get better. The resulting plate seen below, which was a tad shy of perfection due to my not working with that format for a number of years, sold quickly and is now varnished and curing before I’ll mail it out from who knows what town I’ll be passing through in a week. Driving all evening and slightly into the night put us in a little town of Winnemucca, Nevada for the night, and next day I literally drove drove all day to make it to Salt Lake City before the sunset. Jozlynn has never seen the Temple there and at sunset it’s a really pretty sight. I pulled up to the western gate of Temple Square with the sun about 2in above the horizon. While Jozlynn hopped off to go exploring all the various museums dedicated to Mormon culture and faith, I went into overdrive mode and set up the chemistry and camera. Running to the temple with a tripod topped with a loaded camera, I got there as the red rays of the sun were illuminating top half of the image. With me, knowing that the path in front of the Temple is rather narrow, I brought the 4in Dallmeyer 1aa wide angle hemispheric lens. Hiding some of the temple behind a tree to juxtapose them, I sterted my 1min f32 exposure. By the time I was half-way done the sun was totally gone, but the plate turned out neat and I was glad to at least make one plate that long day. Once the plate was rinsed and drying we moved on to Christopher’s house - a beautiful modern structure with open floor plan and a great garden. It was nice to get off the road for two nights in a row there, a little retreat amid the travels. We departed the next morning, but not before a small deal was reached, the result of which was me being a new owner of a hand-made iodine fuming box, plus developing jig and some nearly 5x7in plates. A few years ago Christopher did give Becquerel dags a go, but found it wasn’t his thing for several reasons, and so now I might just make a few B-dags just for fun since I can’t fit plates that size into my mercury chamber. That day was actually Jozlynn’s birthday, but there were plans to be fulfilled and it turned out to be mainly a people-meeting day. We first had to see Chris Blackburn – another SLC wet plater, who does very good work at events and in his downtown studio (well, to me it seemed like downtown anyway). Chris had a gallon of Everclear that I had him buy for me a while back, but which was never shipped, and I need it on this trip, so this worked out great. Plus we’ve been online buddies for quite some time, and I’ve heard a lot about his from Conrad Young, a San Diego wet plate buddy of mine whose family is in SLC, so it was great to finally meet him and see in person his wonderful large gelatin cyanotypes on glass backed with gold leaf – incredible! Next on the agenda was a lunch with Charles Trentelman in Ogden, 40min north of SLC. Charles and I became bonded online a while back over our shared passion for old cameras in general and for Minox spy cameras in particular. Charles used to be in journalism, but now is retired and spends his time making great images and volunteering at the Ogden train museum. To lunch he brought a local friend of his who used to run a camera shop in Long Beach CA, before retiring 10 years ago in Utah. >>>>>>>>>>>>>>> brought a wonderful gift – additional vintage process books for Photo Palace library. There’s one on carbro there, one on bromoil, one on general negatives and more. We had a wonderful lunch a small local diner on 25th street and then headed to a hotel, before a dinner at a great local Italian place called Zucca. After dinner, we met yet another photographer – Hanako Murakami. Hanako is Japanese living in France and her work is very medium-oriented. Currently she’s experimenting with Becquerel daguerreotypes, and actually I met her through Luther Gerlach, who a couple of weeks ago recommended me to her for a small workshop and some trouble-shooting. After Hanako came though San Diego, she headed to Nevada for an artist residency, but we happened to be in Ogden at the same time (as she was on her way to see Spiral Jetty in Great Salt Lake), so it was great to meet up again and see the work we both did since the last time. 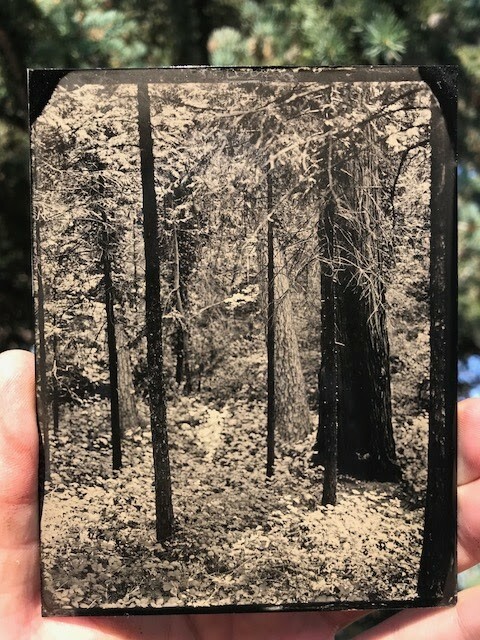 Next morning our tent was in the shade and by a beautiful little waterfall, so we slept in a bit… Still a nice little ¼ plate daguerreotypes was made and then a couple of 4x5 tintypes. This post is being uploaded from the shores of Bear Lake, UT. It's around sunset and we're hoping to find a picturesque camping spot just north of Idaho border. Hope you enjoyed the read. P.S. 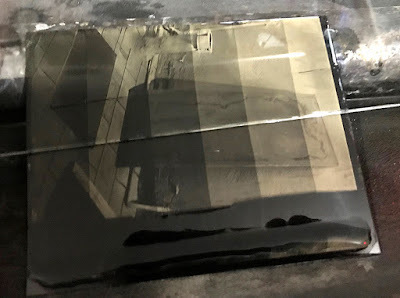 Daguerreotypes are had to photograph with a phone, so sorry for image quality… Once back home I’ll copy all the plates properly and make a separate post with just the keepers. 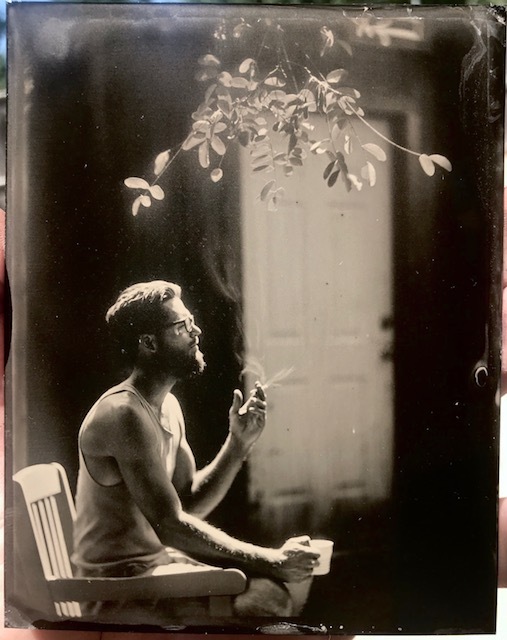 “How do I figure out how long to expose and develop for?” This is a question I hear again and again as new collodion practitioners are added to the ranks. Recent discussion with one of my students inspired me to this post. I think here is a simple and straight-forward example of how one can easily and quickly determine the two above factors in pretty much any new situation or with new chemistry (provided that all chemistry is harmonious). 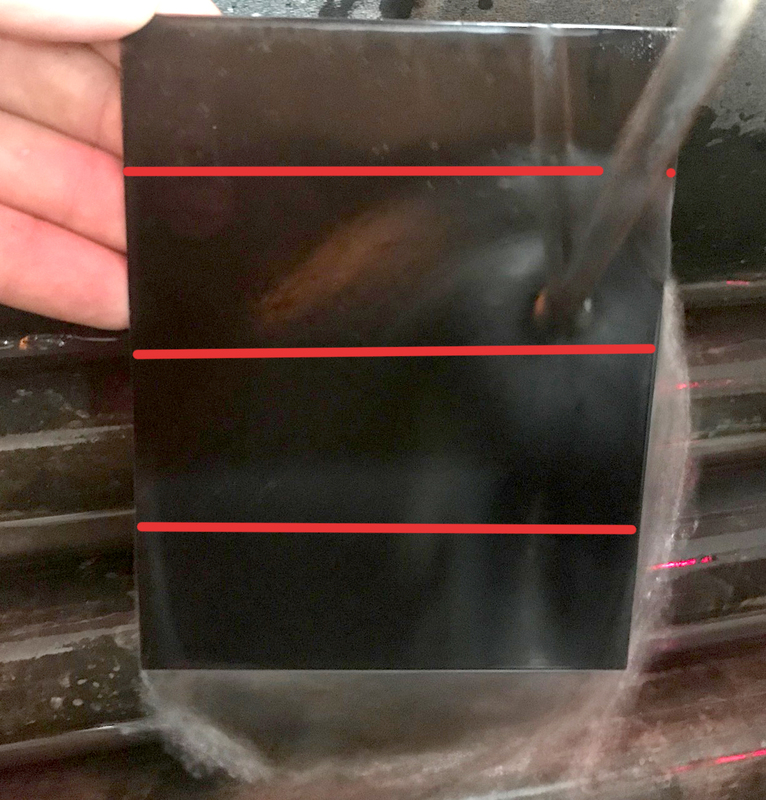 Exposure test strip on a plate is done simply. For some reason or another I actually never have done this test when I started, though I’ve seen it and it made a lot of sense. Before doing the test and with light on, pull out the dark slide in your holder, but not all the way out - only until it JUST disappears from the opening. Now on the inside side of the slide draw a nice big line that will appear just as you pull it to that point – black fat Sharpie works well for this task, it’s black on black, but you’ll still see it. Then mark 5 more spots between that line and the handle of the slide – giving you 6 sections. With the plate in the holder and holder in camera and lens cap on – pull out the dark slide to that big line and give it the shortest exposure you’re testing for (in case of my test it was 1/2sec). Then close the slide to the first mark and give it same exposure – now you have that strip exposed for 2x the previous one (so in my case 1sec). Close it again to the next dot and give it the combination of two previous exposures (in my case 2sec). Move slide in to next dot and give exposure again equal to sum of all previous exposures (so in my case 4sec). Repeat for next two dots. Above test is all well and good if you know and keep a certain constant ideal development time for your chemistry. However, what if you’re working with a new developer or collodion formula? Or what if instead of working in a temperature-controlled darkroom you all of a sudden find yourself in the desert of Arizona trying to shoot the most awesome cactus ever, but it’s 100°F out? Well, then the “Anton Dev Test” might come in handy. Simply sensitize a plate and give it no exposure, and keep it on the plate for say half the time you think you should in theory hold it on that cactus plate you’re about to nail. At that point, tip the plate away from you and, with developer all but gone off the plate, with a nice steady stream of water (not too strong – squirting rinse bottle actually works great for this) start rinsing the bottom quarter of the plate – back and forth, back and forth. In 5 or 10 seconds move up and start rinsing the entire bottom half of the plate. Then in another 5-10sec move up to three quarter line, and finally in another 5-10 rinse the whole thing. Fix the plate and take a close look to see if any of the development time strips you created have overdevelopment fog in them. If so, see where it starts and then your maximum possible development time should be a few seconds before that fog starts to appear. My developer was from the fridge and at 57°F, but in the darkroom it was 82°F, so I knew that in those conditions at about 45sec is when fog will start to show up. Personally, I like exposing in such a manner that I can go to the maximum development time possible. Indeed, as you can see in above Anton Dev Test blank plate, it’s the 50sec strip that starts showing slight fog overall and has some very overdeveloped spots where some inconsistencies in the plate were. By 60sec development all black areas are fogged badly. After working with collodion for a bit, I now know that the below scene, with Rodenstock Sironar 180mm lens at f32, and with my collodion and developer mixes, would need 4sec exposure and 42sec development. However, there are certain times when you might want to overexpose and under-develop, or just over or underexpose and go to maximum dev time… So, I moved the tripod in a little in order to have more even tones filling the composition, and below is the combination of Exposure Strip and Anton Dev Test. As shown in the topmost image, in order to most accurately separate development areas I shielded those parts of the plate I didn’t yet want to wash off by laying a larger piece of glass right onto emulsion and pouring water over that, hence the scratches along those lines. I use KCN fixer - with severe underdevelopment (which is usually about ½ time or less of maximum development time, so in my case 20 of the possible 45 or so seconds) it actually eats away the few image silver particles that had time to form on the surface. With other types of fixers this may not happen, but you’ll have really weak image with blue highlights. At 30sec image is not bad in overexposed parts on top. With 40sec the image is now acceptable in a wider range of exposures in the middle – it’s really all up to you to decide how you want a particular scene to look in the final plate… With 50sec development there’s probably a touch of fog in the shadows, but there’s not a lot of shadows in that strip, so that little bit of it doesn’t really come out as very visible, however, even in less exposed parts, image is now looking a bit flatter. Actually you can see fog pretty well in the 1/2sec exposure 50sec development section, but it looks like tone of the panel that's laying on the roof - it's not, that panel with that exposure and proper development would be near black. As you can see – there’s quite a bit of leeway in how long you can expose and develop a plate for depending on your personal final vision for your image. The two tests above, in combination or separately, can be helpful to any beginner though when faced with new unfamiliar lighting, scene, or environment. P.S. 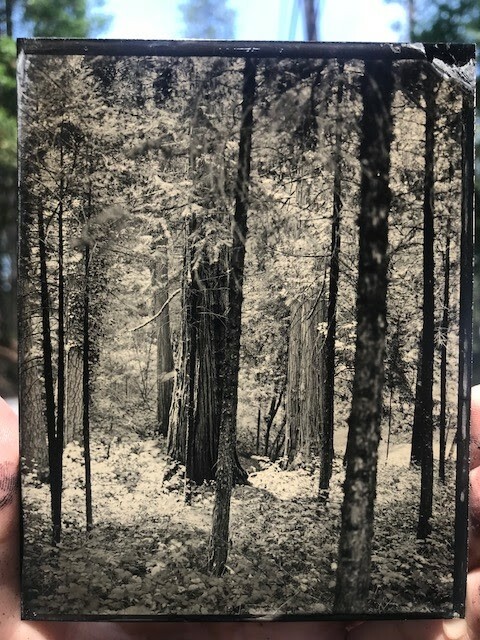 Something that might be of interest to all wet plate, daguerreotype and dry glass plate shooters - just two days ago I received a finished prototype of a new line of plate holders that will soon appear for sale via a separate page on this blog like our Custom Lens Caps and Head Brace. 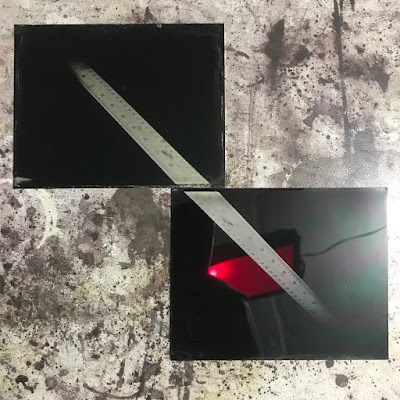 As the prototype is not made of final materials and doesn't have the beautiful finish that it will have once ready to see, I opt out for posting the focal plane test plates below - looking spot on agains the known control!